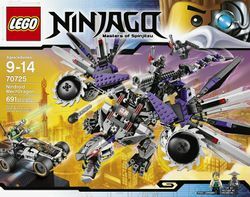 70725 Nindroid MechDragon is a Ninjago set that was released in January 2014. It contains 691 pieces. It was released in December 2013 in the US and Canada. The main part of the set is the nindroid mechdragon which features a prison cell, spinning blades and articulated tail. Also included is a car/tank for Lloyd and Sensei Garmadon. This is a description taken from LEGO.com. Please do not modify it. Enter the MechDragon! Sensei Garmadon and Lloyd are trying to escape with the Techno-Blade in Nya's car, but Sensei Wu, who has turned evil, and the Nindroids are flying the MechDragon in hot pursuit. Drive clear of the MechDragon's fast-spinning circular saw blades on the huge wings and dodge the missiles fired from the cannon. Evade its mechanical mouth, giant claws and dangerous whipping tail. Evil Wu is at the controls with two other armed Nindroids below ready to jump off into battle. Don't let them capture the Ninja and imprison him in the hidden cell to power their MechDragon. Speed away in Nya's car and fire the harpoon and unleash flick missiles from the hidden cannons to repel them. Includes 5 minifigures with weapons: Sensei Garmadon, Lloyd, Evil Wu, General Cryptor and a Nindroid. Sensei Garmadon and Evil Wu are exclusive to this set. The MechDragon is the eighth Ninjago set with a dragon. This set and 70722 OverBorg Attack are the only two sets in the early 2014 wave to not include techno-blades. Facts about "70725 Nindroid MechDragon"
Enter the MechDragon! Sensei Garmadon and Lloyd are trying to escape with the Techno-Blade in Nya's car, but Sensei Wu, who has turned evil, and the Nindroids are flying the MechDragon in hot pursuit. Drive clear of the MechDragon's fast-spinning circular saw blades on the huge wings and dodge the missiles fired from the cannon. Evade its mechanical mouth, giant claws and dangerous whipping tail. Evil Wu is at the controls with two other armed Nindroids below ready to jump off into battle. Don't let them capture the Ninja and imprison him in the hidden cell to power their MechDragon. Speed away in Nya's car and fire the harpoon and unleash flick missiles from the hidden cannons to repel them. Includes 5 minifigures with weapons: Sensei Garmadon, Lloyd, Evil Wu, General Cryptor and a Nindroid. This page was last edited on 9 January 2016, at 20:18.